Mila doesn’t know why her mother decided to move them to the middle of nowhere after the house fire that killed her dad, but she adores the horses that they care for together and has found a little peace in her new, quieter life. All that is shattered when she breaks her arm in a car accident — literally. Her arm is broken open, exposing tubing that leaks clear fluid instead of blood, and metal and wires where there should be muscle and bone. Her mother grabs a first-aid kit – pliers and screwdrivers instead of bandages and gauze – and explains to Mila that her entire life is a fabrication. Her memories are not her own, but uploaded to create a plausible backstory for their new life together. The woman she calls mother is actually a scientist who stole her from a top-secret lab when she had moral questions about the very human attributes her project was displaying. Even her name is not her own – it’s an acronym for Mobil Intel Lifelike Android. With questions flying and their cover blown, Mila and her mother try to escape to Canada – but there are two groups of people after them. The military wants their expensive prototype back, and terrorists are equally dedicated to finding Mila and using her for their own purposes. 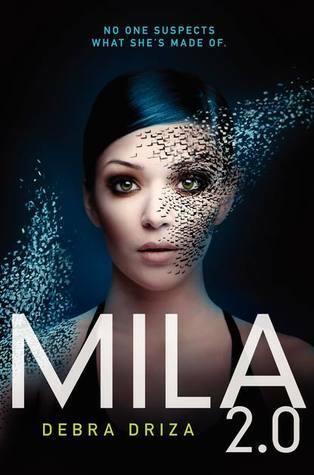 With her elite defense mechanisms activated, Mila is more than capable of defending herself and protecting her mother. But her human elements keep getting in her way. How far will she go? And is she more human… or robot? I just finished this and really liked it. Thanks for spotlighting it.